Full disclosure: I don't like hip hop. Time and again, people have tried their damnedest to get me listening to hip hop. Buddies, girlfriends, enemies. I have been given mixtapes and forwarded playlists, all to no avail. This isn't to say that I don't respect hip hop. This isn't to say that I cannot recognize the genius of Straight Outta Compton or The Low End Theory. But Ed Piskor's Hip Hop Family Tree did something that none of my people have ever before managed: it got me to actually sit down and listen to the music. Hip Hop Family Tree is, of course, not a history of rap alone. As those familiar with the genre can attest, it's difficult to separate the music from other elements of the "culture" -- b-boying, graffiti, lingo, style. Piskor demonstrates an affectionate respect for the interrelations between these phenomenon, telling a story of a culture, rather than a musical genre. He begins with Cool Herc's parties and, as of this writing, has reached the point in which downtown punk and uptown hip hop first come into contact. For one fleeting moment, American music was poised to go into an odd direction. Like a good social historian, Piskor focuses on the human relationships that drove hip hop's development -- from antagonistic competition to opportunistic collaboration -- giving the reader an insight into the haphazardness of cultural development. Of course, history is made by people, but not always under the conditions of their own choosing. And events are random on a level that human interaction can never attain. That's why a city-wide blackout lead to the expansion of DJ culture throughout New York, allowing kids to emulate their heroes and, eventually, one-upping them. This is history, nonfiction. But Piskor manages to tell the story dynamically, moving between events quickly. Sometime, almost haphazardly. On some pages, events are jumbled together. On others, the transition from one event to another happens too abruptly -- the first event either left unresolved or its significance to the page's second event is unclear. This, however, is just an occasional nuisance that takes nothing away from the overall reading experience. 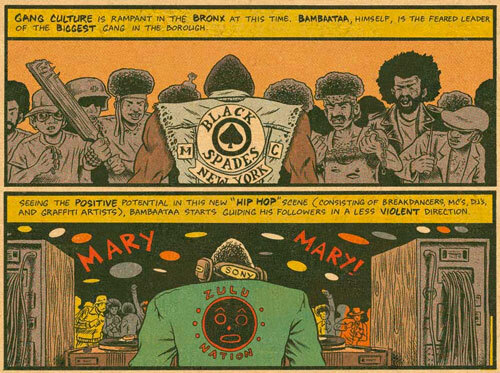 Though the writing -- and the very idea of a comic history of hip hop -- is great, the art is remarkable. 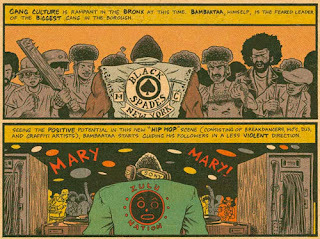 Piskor's style has often been compared to underground luminaries like Crumb, but Hip Hop Family Tree seems to draw as well on Marvel's house style from the seventies. Piskor's art is nostalgic without being derivative. The coloring complements the old school pencil-and-ink, demonstrating how comic art can itself evoke history. There's more. Hip Hop Family Tree doesn't read like a web comic. It is rather a comic book on the internet. Which means Ed Piskor has drawn pages. This isn't four panels on Tumblr, but actual pages from a comic book, pages that an artist spent time on. Yellowed pages that look like old comic book pages looked. There's thought at work here. Oh, but I have a gripe. Not an insignificant one, either. Fortunately I can lay this one entirely at BoingBoing's feet. Hip Hop Family Tree isn't easy to read. To begin at the beginning, you'll need to go to the fairly useless index and scroll down -- and down -- until you get to the first installment. Which, of course, is not clearly identified as such on the website. How about a "start with part one" button? Or we can simply wait until September when Fantagraphics will release a trade of Hip Hop Family Tree and we can read Ed Piskor's pages as it was meant to be read. Pages.